Jehovah’s Witnesses pride themselves with being the only ones going from house to house. 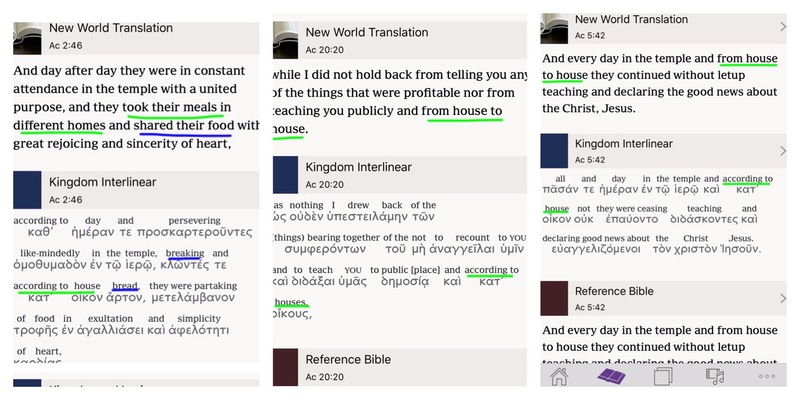 In green, you can see that in all three verses “according to house” is in the Greek. But why would NWT change the wording in the first verse? I think it’s clear. They have made a “house to house” doctrine for themselves that this verse does not fit into. Therefore it must be changed to uphold their doctrine. And in blue you can see they ignored “breaking bread” in the Greek and just made it say “sharing food.” This, too serves their doctrines and teachings because they of course don’t break bread from house to house…nor do they break it at all (in the sense that they are partaking of bread or wine in relation to the covenant of Christ). It’s a tangled web they weave. If you want to know what the Bible teaches, just read it. Next Post Man of my Dreams or SlimFast? How does their mysterious translation committee sleep at night? I wish I could be there when they discuss passages like this and decide together to tweak them to fit their doctrine. I wonder what kinds of rationalization goes into the justification of such a practice. It’s definitely a reckless and damning occupation.